Hi, I am interested in your 1973 MG MGB (stock #4798-CHA) listed on Autotrader for $11,995. I'd like to get more information about this vehicle and confirm its availability. 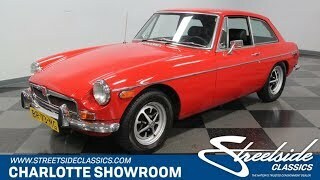 With its more unique styling, nimble handling, and extra practicality, this 1973 MGB GT is one of those great classics you never need much convincing to enjoy... especially at this affordable price. An MGB GT dressed in an Italian-style deep red just seems appropriate. After all, these hatchback coupes had a bit more flair than the roadsters thanks to an update by Pininfarina. But beyond this Italian update is the British style we all love. The sleek lines with just the right amount of chrome give these earlier MGBs like this one a confidently regal appearance. The later cars trade in their chrome grille and chrome rear bumpers for black plastic units, so this one appreciates its history with well-maintained bright work. Even the sweeping trim line runs unbroken over the whole profile. And the Rostyle wheels are also such a part of this icon that youll love to see a fresh set of these alloys on the coupe. Those familiar with the roadster will feel right at home hopping into the GT. The entire inside envelops the driver like a second skin. The space between the three-spoke wheel and the wood grain stick shift is exceptionally close for comfortable and quick performance. The driver gets a full set of Smiths gauges with a large speedometer and tachometer, as well as dials for other vitals such as oil, fuel, and water. Plus, there have been some nice upgrades like the AM/FM/CD stereo and bucket seats finished in cloth. What really makes the GT distinctive is behind these buckets. The hatchback gives you genuine luggage space and versatility that the roadster never could. This gives you the versatility to pack all the toys you want for any weekend getaway. Lift the hood to see the peppy 1800cc motor. While this looks authentic right down to the British Leyland valve cover there also nice signs of improvement. For example, this motor now inhales through a Weber carb properly mounted on a Pierce intake manifold. Theres a surefooted feeling on the road thanks to front disc brakes and new Goodyear tires. So this coupe has the kind of investment that just begs for the open road, and thats exactly what an MGB GT is all about. The sound of the motor, the slickness of the four-speed gearbox, and unmatched tight handling will make it your favorite classic. This is a distinctive coupe thats far rarer than its roadster siblings, and it even has the bold red to stand out further. So when something so desirable is also affordable, you need to hurry up on this deal. Call now!